From ghost towns and the Grand Canyon to roadside burger joints and the cosmopolitan streets of San Francisco, this region is qloaded with the intriguing and the incredible. Best of all, this Los Angeles to San Francisco itinerary is structured so that those short on time can experience the region's best. At any of the sights you’ll get great pictures and a greater appreciation of what you’re seeing. Best of all, national park entrances are included, so you can explore Yosemite and still try your luck in Las Vegas. Look for celebs while heading out of town. Visit Calico Ghost Town en route to Laughlin. In the late morning, visit Calico Ghost Town. In late afternoon, continue on to Laughlin for the night. Opt to hike along the rim or down into the canyon. Experience breathtaking scenery with spectacular views. Bring lots of water, a hat and plenty of energy. Remember - hiking down is optional, hiking back up is mandatory! Travel the historic Route 66 through the southwest. The Grand Canyon helicopter ride is a must! Enjoy a bird's-eye view for 45 to 50 minutes as you fly over the canyon, taking in the stark contrast of the the blue-green Colorado River against the thousand shades of red rock found in the canyon. From above, you can fully appreciate the greatness of the gorge and see why it is one of the seven natural wonders of the world. Walk along Las Vegas Boulevard and soak in the lights, energy and pulse of the Strip. With an ever-evolving architecture and multitude of hotels, casinos, restaurants, and entertainment, there's so much to see and do. Leave the world behind, give in to your senses and prepare to be amazed. Take in one of the many shows available in this entertainment mecca. Live music, burlesque, comedy, magic, Cirque Du Soleil, and more. Whatever your passion, no other city can compete with the range and scale of shows on offer 24 hours a day. Head to desolate Death Valley - the hottest, driest, and lowest spot in North America. Travel to one of the country's most rugged landscapes - the legendary Death Valley, California. Soak in the dramatic landscape. We intend on using the Tioga Pass, a scenic route through the Sierra Nevada mountain range that connects Bishop with Yosemite NP. The status of the road is monitored daily, and our travel plan for the area will be confirmed during the trip. Panoramic vistas, gushing waterfalls, and elusive wildlife await. Bring water, wear a hat and sunscreen, and hike Yosemite NP. Keep an eye out for black bears, deer, and coyotes. Set your wheels in motion with tandem, hand crank or mountain bikes, and opt to cycle some of the 20km (12mi) of paved trails throughout the valley floor. Bring a water bottle, stop to shoot photos, and enjoy some of the most picturesque spots in Yosemite NP. Iconic to San Francisco, travel back in time and hop on the world's last manually operated cable car system. Depart from Fisherman's Wharf and catch a glimpse of marine life as we sail around San Francisco Bay. Admire the city's remarkable skyline, get up close and personal with the infamous Alcatraz Island, and sail underneath the Golden Gate Bridge. Enjoy the sunset and make a mental note to return. Travel out to Alcatraz Island for a cell-house audio tour of the infamous federal penitentiary. While there, check out the natural side of the rock—with its gardens, tide pools, bird colonies, and stunning views of San Francisco Bay. Tours often sell out, so book a ticket online (far in advance!) to secure a spot. Rent a bike to peddle across the Golden Gate Bridge, through the scenic Marina district or perhaps to Golden Gate park. Visit San Francisco's famous Fishermen's Wharf, walk the piers, check out the marine life, shop and sample the fresh seafood. What trip to San Fran would be complete without seeing the Golden Gate Bridge? Depending on time, step foot on this famous red suspension bridge or find a great viewing point to take some photos. Check out this neighbourhood known as the centre of counterculture ideals, drugs, and music during the hippie movement in the 60s. Today, find locally-owned restaurants and bars, boutiques, booksellers, head shops and record stores. Allow USD290-380 for meals not included. Board a catamaran and set sail into the setting sun around San Francisco Bay. Take in views of the iconic skyline, breeze past infamous Alcatraz Island, and sail under the Golden Gate Bridge. If you haven't fallen in love with San Fran yet, this should do the trick. From ghost towns and the Grand Canyon to roadside burger joints and the cosmopolitan streets of San Francisco, this region is loaded with the intriguing and the incredible. Best of all, this Los Angeles to San Francisco itinerary is structured so that those short on time can experience the region's best. At any of the sights you’ll get great pictures and a greater appreciation of what you’re seeing. Best of all, national park entrances are included, so you can explore Yosemite and still try your luck in Las Vegas. All national park and national monument fees. 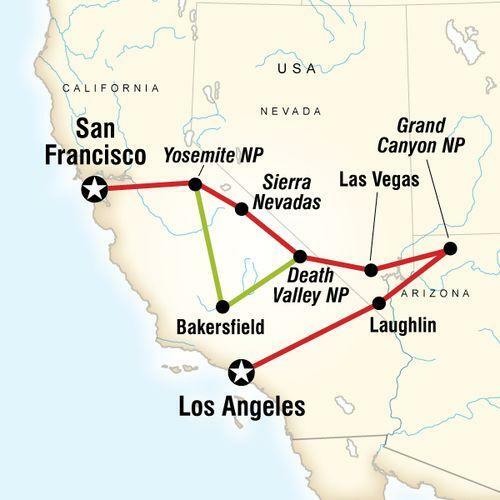 Orientations to Los Angeles, Las Vegas, and San Francisco. Calico Ghost Town visit. Route 66 drive. Grand Canyon visit with sunset at the rim. Death Valley visit. Tioga Pass drive (seasonal). Yosemite stay. All transport between destinations and to/from included activities. Bask in the big city lights of Los Angeles and Las Vegas, wind through the streets of San Francisco, hike through Yosemite, feel the heat in Death Valley, get your kicks on Route 66.